Since my oldest started kindergarten last week, I've been working on finding after-school and breakfast snacks. Most days he comes home ravenous and wants to eat everything in site, so I've been searching for high protein snack options that will tide him over until I finish dinner. Most of the recipes that I have come across have been high in sugar, with little fiber or protein. 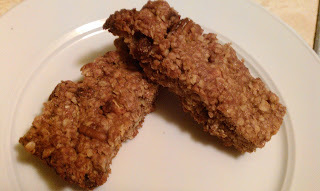 I was pleased when the August issue of All You magazine had a recipe for Fruit and Nut Granola Bars, which had both fiber and 6 grams of protein per serving. This recipe has 13 ingredients. I actually ended up making the recipe twice. The first time I followed the recipe as stated and was disappointed by how dry the granola bars turned out. For the second attempt I modified the recipe. Instead of using a 1/3 cup of maple syrup, I substituted a 1/2 cup of honey. This allowed the granola bars to bind together better in the pan and made for an overall crunchier bar. Additionally, no one in my household really appreciates walnuts, so I substituted pecans. Finally, I ran out of dried apples in the second batch, so I used both golden and regular raisins instead. My second attempt at these bars turned out really well. The substitution of the honey was delicious and helped the bars to bind together much more effectively. These granola bars would work well with a variety of dried fruits, such as cranberries or blueberries or even chocolate chips. This recipe is a great after-school snack, that would work well with a number of different ingredients. 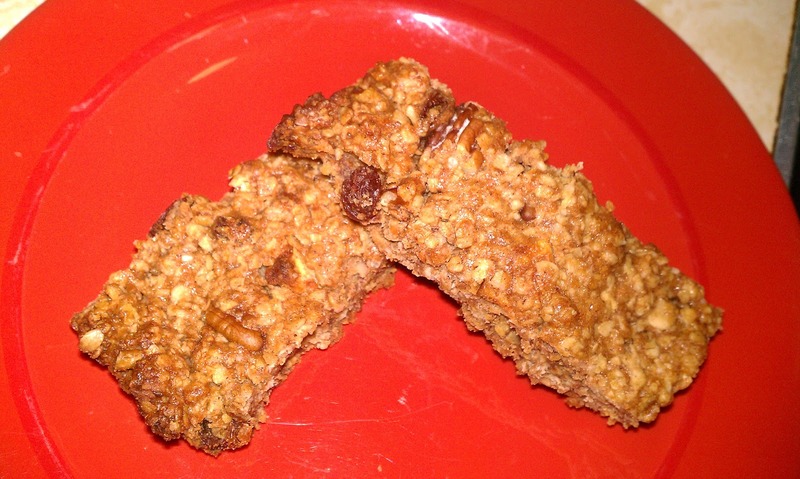 For the recipe go to All You Fruit and Nut Granola Bars. Oooh, thanks for this! I've been looking for a great granola bar recipe. So far I haven't found one. Will try this one next! Great idea! I know I need to do the same thing, especially with breakfast. I'm also looking for more crock pot and freezer meals! My 12 yr old will LOVE these. He is VERY into eating healthy. I know, huh? I'm happy about that. Thanks for the recipe, and thank you for following The Big Green Bowl! I am following you too. These look yummy, I'm always on the look out for good snacks for my kids! Thanks for sharing, following you back! @Amber I hope you like it! @E It's hard to find high protein snacks, this one has 6 grams per serving, which is pretty good!